Ajax Chess (diagram below left) introduced the concept of adding moves without capturing aroung the 1-step perimeter of pieces. The inspiration of adding this extra move around the pieces' perimeter came from the Man or Commoner (diagram below right) from Courier Chess. Those pieces that could already capture on any of their 1-step moves retained that capture ability, but gained the ability to move without capture in the remaining 1-step directions (i.e. Rooks can move 1-step diagonal). Other pieces (like the Knights) gained a total of 8 squares (orthogonal and diagonal) non-capturing moves around their perimeter to relocate to, and execute their attacks. The novel 'Ajax Effect' (as Carlos Cetina baptized it) can be applied to numerous existing different variants; keeping the original flavor of the variant, while adding the new Ajax relocating outpost complexity to the field of Chess Tactics. Charles Gilman is credited with proposing the application of the 'Ajax Effect' to the well known Chinese Chess (Xiangqi) variant. Ajax Xiangqi features a new (and stronger) Elephant that is able to reach all squares on the player's side of the river. New Kings and Guards are also featured that can now reach ALL squares within the Palace, being able to capture in their original Chinese direction, and being able to move (but not capture) in the other. The traditional Xiangqi board is a grid of ten horizontal lines and nine vertical lines. The vertical lines are interrupted in the middle, so that the board appears as two grids of five horizontal lines by nine veritical lines. This interruption is called the river. It serves as a barrier to the Elephants. Other pieces can pass over the river as though it's not there. Pawns gain the ability to move sideways after crossing the river. 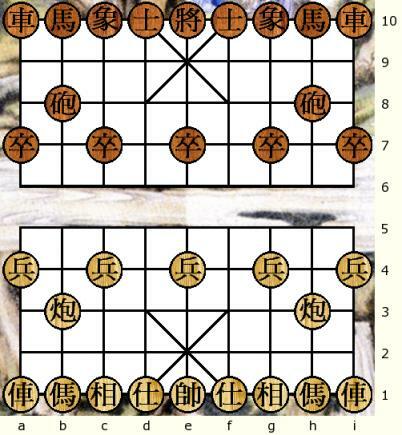 The board appears very similar to other uncheckered boards, such as the boards Shogi and Chaturanga are played on, but instead of going in the space demarcated by the lines, pieces go on the intersections. These intersections are called points. Two palaces are positioned at opposite sides of the board. Each is distinguished by an x-shaped cross connecting its four corner points. Throughout the game, each player's King (General) and Guards (Mandarins or Advisors) must remain in the palace. The lines in the Palace have no meaning other than marking the boundaries of the Palace. For instance, a Guard at f2 can move diagonally and capture at e3, even though there isn't a diagonal line between those two coordinates. 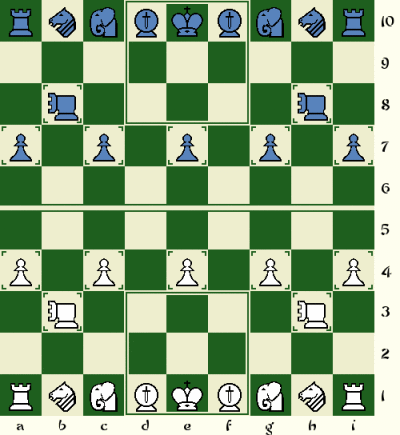 An alternate Cambaluc Checkered Board is also available which western players may find the game less forbidding and with more familiar equipment. Like the traditional board, it marks the river, the palaces, and the spaces that Cannons and Pawns begin on. The same Chinese pieces/symbols are used as in Xiangqi, with the additional Ajax moves. The General is renamed to King, Chariots are renamed to Rooks, and Mandarins are renamed to Guards. King (Chinese General): An Ajax Wazir that moves and captures like a Wazir (1-step orthogonally), plus Ajax 1-step (non-capturing) diagonal. It can't leave the palace. The two Kings cannot face each other on an open file. If either King sits exposed on an open file, the other King may not move to occupy that file (i.e. the 2nd King would be in "check" by the 1st King). Guard (Chinese Mandarin or Advisor): An Ajax Ferz that moves and captures like a Ferz (1-step diagonally), plus Ajax 1-step (non-capturing) orthogonal. It can't leave the palace. Rook (Chinese Chariot): Regular rook, plus Ajax 1-step diagonal. Knight (Chinese Horse): Regular Chinese Knight (moves 1-step orthogonal followed by a 1-step diagonally outwards, first step must be unoccupied), plus Ajax 1-step orthogonal or diagonal. Knights are not leapers. Elephant: Regular Chinese Elephant (jumps 2-steps diagonal, first step must be unoccupied), plus Ajax 1-step orthogonal or diagonal. It can't cross the River. Elephants are not leapers. Cannon: Regular Chinese Cannon (moves like a Rook, but must jump a piece orthogonally to capture the target; piece 'jumped' can be of either color), plus Ajax 1-step diagonal. 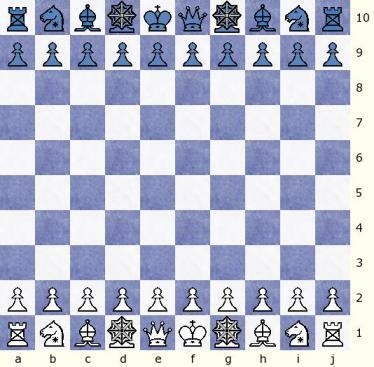 Pawns/Soldiers: Regular Chinese Pawn - No Ajax additional moves. Moves one square forward before crossing the river. Pawns gain the ability to move sideways after crossing the river. All Xiangqi rules apply, with the additional 'Ajax Effect' adding 1-step non-capturing moves in the directions they normally couldn't reach before. The goal of the game is to checkmate or stalemate the opponent's King (General), just as in regular Xiangqi. Stalemate is a loss (just like in Xiangqi) for the player with no legal moves.